Thermo-Pond 3.0 is the third generation of the most efficient and advanced pond heater on the market. 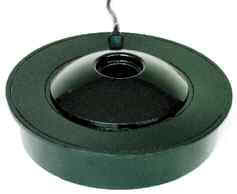 Keeps an ice-free area on pond surface to allow for toxic gas escape throughout the winter. Operates on only 100-watts!! Will not harm pond liner or plastic ponds. State-of-the-art thermostat with larger heat radius. Increased cord strain relief and oversized drip edge to prevent water contact with seal. Upgraded plastics that exceed 2004 UL listing standards. 12' cord and leak-proof entry port.